There are fifteen City of Fort Collins Natural Areas that permit fishing. 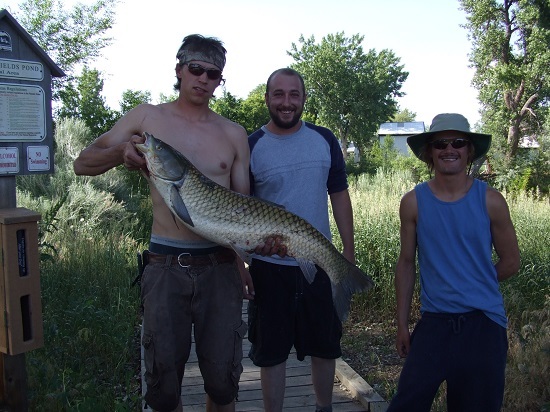 Here you can learn more about fishing access, species present, and regulations. Check out the fishing brochure! Arapaho Bend Natural Area: Pond fishing is permitted east of Strauss Cabin Rd. Some river areas closed to fishing and access; no fishing from Arapaho Bend's north boundary, downstream approximately 300 yards. This area is posted with closure signs. Also, no river fishing or access to river allowed east of I-25. Fishing and river access are permitted west of I-25 upriver several hundred yards to the area closed by posted signs. Parking at the Harmony Transfer Center lot or Strauss Cabin Road parking lot. Butterfly Woods Natural Area: No fishing or river access, must stay on paved Poudre Trail. Cattail Chorus Natural Area: No pond fishing, river fishing access allowed from paved Poudre Trail. Cottonwood Hollow Natural Area: No fishing or river/pond access. Gateway Natural Area: River fishing is permitted, access is from Gateway's parking areas. Kingfisher Point Natural Area: No river access on the north side of the river. River fishing is permitted on the south side of river. Pond fishing is permitted on the west side of Timberline Rd. Access is from the paved Poudre Trail or the Kingfisher Point Natural Area parking lot off Timberline Road. Magpie Meander Natural Area: Pond fishing permitted. Parking and access is from Soft Gold Park parking lot on Hickory Street. Mallard's Nest Natural Area: Fishing in Spring Creek permitted. McMurry Natural Area: River and pond fishing permitted, please use designated access points only. Parking access is from Hemlock Street parking lot. North Shields Ponds Natural Area: Pond fishing permitted. Parking and access is from the Shields Street parking lot. Pineridge Natural Area: Fishing permitted in Dixon Reservoir. Access is from the County Rd 42C parking lot or from Maxwell Natural Area's parking lot. Prospect Ponds Natural Area: Pond fishing permitted. River fishing permitted along Poudre River Trail between the two diversion structures on City Water Reclamation property, southeast of Prospect Ponds Natural Area. Access from the paved Poudre Trail. Parking at the south Prospect Ponds Natural Area parking lot off Sharp Point Drive. Riverbend Ponds Natural Area: River and pond fishing permitted. Parking and access from the three Riverbend Ponds parking lots, off Cherly, Cairns or Prospect streets. River's Edge Natural Area: River fishing permitted. Access is from Legacy Park off Woodlawn Drive. Running Deer Natural Area: Pond fishing permitted on the CSU Environmental Learning Center's small pond near Prospect with fishing pier. Access is from the Prospect Street parking lot. Salyer Natural Area: River fishing permitted. Parking access is from Legacy Park off Woodlawn Drive or McMurry Natural Area parking lot off Hemlock street. Springer Natural Area: No fishing or river access, must stay on paved Poudre Trail. Udall Natural Area: Fishing not permitted in the ponds or on the the south side of the river. Access to the north side of the river is okay from the paved Poudre River Trail. For this access, park at Buckingham Park off First Street. Fish species by pond gives details about what species are in each pond, and what species are stocked (from 2014).